The Chicago skyline is one of the most impressive city skylines anywhere, and it's bound to capture your attention on more than one occasion during your visit. The central downtown area of Chicago, or the Loop, as it is commonly called, is home to the tallest and fourth-tallest buildings in the United States, and just north of the Loop boundaries, the country's second- and sixth-tallest buildings rise high into the sky. An array of other lofty edifices share the air with the Willis Tower (formerly the Sears Tower), the Trump International Hotel and Tower, the Aon Building, and the Hancock Building, which are the four tallest Chicago buildings, respectively, and the result is a mesmerizing city panorama. Taking in the Chicago skyline view from a number of different vantage points is recommended during your visit. Whether you are admiring the Chicago skyline at night or during the day, it never fails to impress. 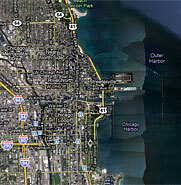 To get the best Chicago skyline view, separate yourself from the downtown area. There are a few ways to do this, the easiest of which involves staying on land. Whether you head north, south, or west of the Loop by way of foot, public transportation, or rental car, once you get a decent distance away, you will enjoy full views of the Chicago skyline that are worthy of exhausting your camera batteries. If you're near the United Center, for example, which is on the West Side, your view of the Chicago skyline will put the Willis Tower on the right and the Hancock Building on the left. Moving left to right, some of the taller buildings that you will see include the AT&T Corporate Building, the Aon Center, and the Water Tower Place. Farther left you will see the Trump International Hotel and Tower standing above other impressive structures such as the Wrigley Building. One of the best places to see the Chicago skyline is the Museum Campus, which can be found on the southern end of Grant Park. This view will have you looking towards the skyline from its southeastern side, with Lake Michigan in the foreground. The lake helps add extra depth to the view. Navy Pier, which extends into Lake Michigan farther north, on the city's eastern side, is also a great place to go if you are looking to enjoy a stunning Chicago skyline view. Both of these lookout points are ideal for viewing the Chicago skyline at night, as the city lights reflect off of the lake. While staying on land affords many fine opportunities to take in the Chicago city views, heading out to sea is also an option. Chicago boat tours are popular, as many not only take you up the Chicago River, but out onto Lake Michigan as well, where the skyline views are hard to beat. Finding a good lookout point on land and heading out onto Lake Michigan for some impressive shots aren't the only options that will be available to you when it comes to taking in the Chicago downtown skyline. Unless you are afraid of heights, heading up to either the Willis Tower Skydeck or the Hancock Observatory will reward you with a bird's eye Chicago skyline view that will surely take your breath away. The Hancock Observatory is arguably the better of the two lookout points, so if you only have time for one, then it might be your first pick. You can grab some drinks and appetizers at the top while you're at it, which makes for an unforgettable dining experience. Once the sun goes down, both of these lofty lookout points offer views of the Chicago skyline at night that will also prove to be unforgettable. While the more modern downtown buildings in Chicago are impressive enough, it might be older buildings such as the Carbide & Carbon Building that really make the Chicago skyline so special. The Carbide & Carbon Building is an Art Deco gem that dates back to 1929. Mostly dark green in color, it is accented with gold terra-cotta leaf designs, which give it an appealing look. Another older Chicago building that accentuates the skyline is the Chicago Board of Trade, which was built in 1930. The tallest building in the city for 35 years, the Chicago Board of Trade stands 605 feet tall, so it's a lot harder to notice than it used to be, thanks to the more modern giants. When you're not enjoying views of the Chicago skyline from afar, heading into the maze of buildings to explore is an exciting endeavor. As impressive as buildings like the Hancock Building and the Sears Tower look from afar, staring up from the street at the base of the buildings is arguably even more stunning. If you want to really make sense of the Chicago skyline during your next visit, you can always book an architectural tour. The most popular architectural tours in Chicago have you zooming up the Chicago River for a look at some of the more historic and impressive structures. But if you don't have time for a tour or you want to save your money for other things, simply admiring the Chicago skyline on your own will still make a lasting impression.